Ottawa, being the Capital City of Canada, is a city rich in history and beauty. When having your wedding in Ottawa the possibilities for ceremony and reception sites are endless. 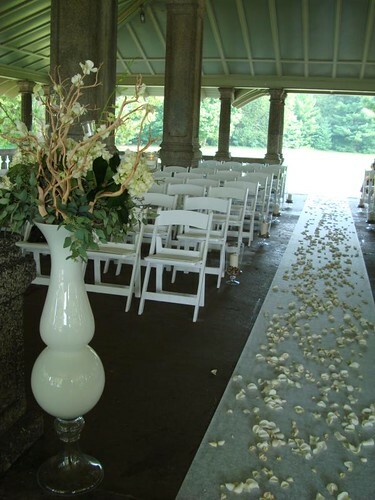 You can have you wedding along the famous St. Lawrence River or many other popular outdoor locations. While there are so many wedding ideas it might be hard to decide where to have your ceremony. Some wedding reception venues offer ceremony locations on site, such as Ottawa Golf & Country Clubs, but what if you are having your wedding ceremony off-site? In this case we recommend the historic Rockcliffe Park Pavilio overlooking the Ottawa River. The Rockcliffe Park Pavilio was built in 1918. Rockcliffe Park is a popular site for photographs, and is open and free to everyone. This heritage building (or some call is gazebo) is located in Rockcliffe Park, along the Rockcliffe Parkway and looking out over the Ottawa River. The pavilion is sheltered by a roof and open on the sides. This is a beautiful idea for a wedding ceremony in downtown Ottawa. Please note that reserving the pavilion does not give you special rights over other visitors who may wish to take photographs in the park. We know wherever you choose to have your Ottawa wedding ceremony is will be beautiful and we wish you all the best planning your Ottawa Wedding.